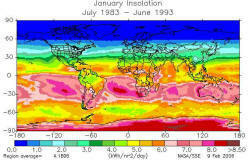 Tools that give sun position, climatic data for solar design, and radiation on a solar collector. Tools to design window overhangs. If you are going to do a solar project, you need to do a Solar Site Survey to make sure that your site gets enough sun during the right times of year to make the project work. This free and simple survey only takes an hour and is fun and educational. Its a must do for any type of solar project! 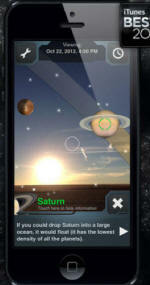 Skyview app to do solar shading surveys The free Skyview app is normally used to allow iPhones etc. to find stars in the night sky, but it can also be used to do a first cut solar survey to find obstacles that shade your solar collectors. To use it, you make sure it is set to your location, then set the date and time of interest, then select the sun object. Standing at your your proposed collector location, pan across the horizon -- the path of the sun will be projected on the screen so you can see when it is lower in the sky than nearby trees, buildings etc. The logical first date to start with would be Dec 21 (the winter Solstice) when the sun is lowest. I tried this on my iPad, and it worked pretty well, but I would still do the site survey listed just above rather than relying fully on Skyview -- it can be a real disaster to get the shading wrong. Thanks to David for finding this and sending it in. Solar Shading and Other Solar Tools for Android Phones... This is reported to be a good set of tools to analyze your solar shading situation for PV or solar thermal installations. They also offer several other PV and electrical oriented tools for Android. This is a nice application from Andrew for the iPhone that allows you to do a solar site survey using the iPhone's built in sensors for measuring elevations and azimuth angles for the survey of the horizon. While I've not had a chance to actually try it, it looks to me as though it would do a good job. Price is now up to $40 at the Apple App Store. 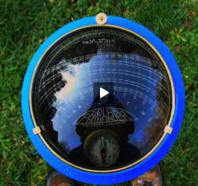 The Solar Pathfinder has been around for many years, and is used by many solar professionals to do solar site surveys. Basically its a glass dome, and the reflection of the objects on the horizon is used to assess the effect of objects on the horizon that would block the sun. Now offered with software assistant. Probably a bit of overkill for the DIYer building one or two projects. Bright Harvest offers a new kind of solar survey. Based on aerial photos, they make a digital model of your house and surrounding obstacles, and then try various arrangements of collectors and estimate the shading for each. In a nutshell, the service is not inexpensive, but the report is impressive. This very good paper provides a very simple set of contour plots that show optimum collector orientation, and the performance effect for deviations from optimal. Covers only the US, but the general relationships would be useful elsewhere. Some limitations -- read the cautions in the paper. 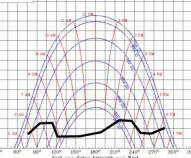 http://rredc.nrel.gov/solar/calculators/pvwatts/version1/ The very useful PVWatts tool can be used to work out the best orientation for solar PV or thermal collectors at your location. Simply try different tilt and azimuth angles until you maximize solar irradiance on your panels over the desired time frame. Climate Consultant is one of the UCLA Energy Design Tools. It provides a variety of ways to visualize weather for a specific location. Weather data files are available for hundreds of locations. This is a brand new version, and is very easy to use. "It graphically displays climate data in either metric or imperial units in dozens of ways useful to architects including monthly bar charts, timetable charts, and psychrometric charts, sun shading charts, and sun dial charts." One of the most interesting charts is the Psychrometric chart with overlays that show the design strategies (e.g. 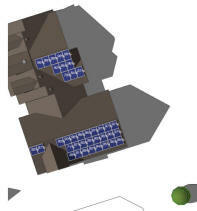 passive solar, evaporative cooling, ..) will work for the location in question. This new site gives very nice summaries of weather for more than 4000 locations. The graphical presentation is very well done, and conveys a lot of information in a very readable format. www.wunderground.com The Weather Underground under the Local Weather -> History tab provides very nice weather summaries for the time period you can enter. Psychrometric Charts are very useful for working human comfort problems and air conditioning schemes, and working out condensation problems. Climate Consultant (just above) provides temperature/humidity data overlaid on a Psychrometric Chart for many locations. 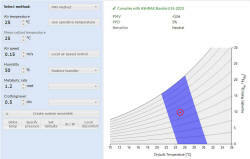 2012, CBE Thermal Comfort Tool for ASHRAE-55. This is a web based comfort calculator. It allows you to change air temperature, humidity, air speed, ... and then shows where this condition falls on the comfort chart. 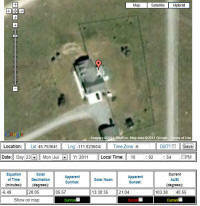 This very handy calculator allows you to zero in on your house using satelite images. You can then see how your house lines up with south, find solar noon, sunrise and sunset times for any date. A helpful calculator that gives sunrise, solar noon, and sunset in local time for any location and any date. Helpful in many situations, including finding true south at your location. 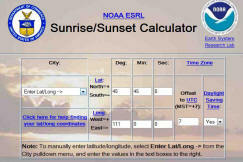 www.suncalc.net A very simple and easy to use calculator to show sunrise, sunset, solar noon, ... at your location. Very handy tool that prints out solar noon for every day of the year for your exact location. Provides solar parameters for solar thermal, PV, solar cooking, etc. based on 10 year history for your exact location. Solar Radiation Tables... The tables provide solar radiation on a south facing collector at various tilt angles and for a range of latitudes. This free online service allows you to search a huge collection of climate data for the US and the world, and then to download the data you select. 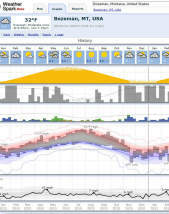 http://rredc.nrel.gov/solar/old_data/nsrdb/tmy2/ NOAA provides a variety of weather related products and data. The CLIM20 product provides pretty detailed historical weather summaries for many US towns. It includes temperatures, precip, and heating and cooling degree days. Lots of good data. NOAA year to date degree days provides deg day totals for the current year. Updated each week. NREL Redbook: Average weather conditions and solar radiation of collectors at various orientations for many US cities. Based on 30 year weather records. Try downloading the pdf version for your state. Can be used to roughly calculate gain for collectors. NREL Bluebook: The Solar Radiation Manual for Buildings gives total and diffuse radiation on S, N, E, W and horizontal surfaces. This can be used as base data for many passive gain calculations. TMY weather files give provide typical hour by hour weather files to provide weather input for simulations. Note that PVWatts, which is a PV oriented calculator by NREL also provides solar irradiance on the surface you specify, and this can be used as input for solar thermal calculations in the same way. 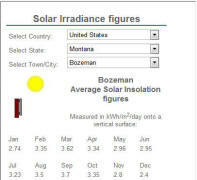 This is a very easy to use calculator that gives solar radiation levels for many locations worldwide by month. It provides radiation levels for equator facing surfaces, and allows you to pick from several tilt angles. This is really a tool for astronomers, but if you are a solar energy nut and you are always obsessing over whether the next 48 hours are going to have any good sun, this tool can be handy. It gives a cloud cover forecast by hour for about 48 hours for thousands of locations. The Solar Spectrum... Shows the distribution of solar radiation energy by wavelength. A nice set of free web tools that give heating and cooling degree day information for 1200 locations. Provides historic, current, and even near term degree day forecasts. Note that a default balance point temperature is 55F is used -- you can change it to the more usual 65F if you wish. An example of how to make apples to apples comparisons of fuel use in for two years ... 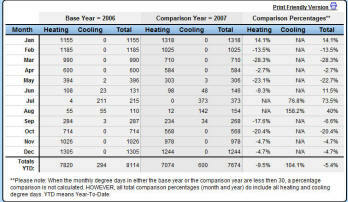 This report provides month by month comparison of heating and cooling degree days between two years you select. This allows you to make apples to apples comparison of fuel use for two years, and to see the actual effect of changes you made to reduce energy use. Nice tool for heating or cooling degree-day summaries for locations around the world. The data comes from Weather Underground stations, so it may be easier to find a location near you. Heating and cooling degree-day maps for the US. 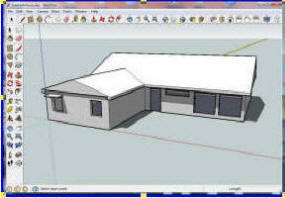 SketchUp is a free 3D drawing tool from Google. In addition to being easy to use as a general purpose drawing tool, it offers a built in sun. You can easily draw a wall with a window and overhang (or a whole home), and play the sun over it for various times of day and times of year. Sun patterns inside the home are also shown. It would be good for modeling sunspaces and greenhouses as well. The overhang design tool is very good, and is the best way to get a quick feel for how overhangs work. The Wind Resource Atlas of the United States will give you a rough idea if you are in a locations with wind potential -- here is how to use it. This is a really useful tool. An easy calculator you can use to find out how much power you will get from a PV installation in your area. It calculates PV system performance based on hour by hour records for sun in your area. Version 1 is very easy to use, and works worldwide. Version 2 allows more detailed inputs, but seems rather complex and puzzling at times to me.